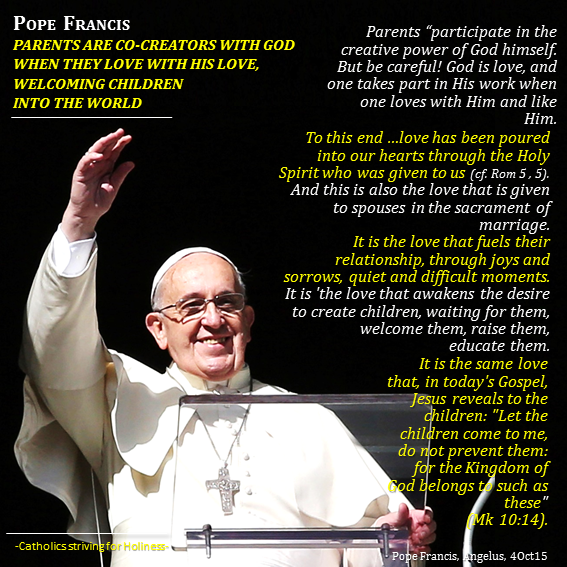 Pope Francis on Parents as Co-creators With and Of God’s Love. Below you have the ZENIT-translation of Pope Francis’ Angelus Address in St. Peter’s Square, last Oct. 4, 2015, following his having presided over Mass for the Opening of the General Assembly of the Synod of Bishops on the family in St. Peter’s Basilica. The Eucharistic celebration with which we began the General Assembly of the Synod of Bishops just ended in St. Peter’s Basilica. The Synod Fathers, coming from every part of the world and gathered around the Successor of Peter, for three weeks, will reflect on the vocation and mission of the family in the Church and in society, for careful spiritual and pastoral discernment. We’ll keep our eyes fixed on Jesus to find, on the basis of His teaching of truth and mercy, the most appropriate ways for adequate commitment of the Church with families and for families, so that the Creator’s original plan for man and woman be implemented and may operate in today’s world, in all its beauty and its strength. The liturgy of this Sunday repeats the fundamental text of Genesis on the complementarity and reciprocity between man and woman (cf. Gen 2.18 to 24). For this – the Bible says – the man leaves his father and mother and joins his wife and the two become one flesh, that is, one life, one existence (cf. v. 24). In this unit, the spouses transmit life to new human beings: they become parents. [They] PARTICIPATE IN THE CREATIVE POWER OF GOD HIMSELF. BUT BE CAREFUL! GOD IS LOVE, AND ONE TAKES PART IN HIS WORK WHEN ONE LOVES WITH HIM AND LIKE HIM. To this end – as Saint Paul says – love has been poured into our hearts through the Holy Spirit who was given to us (cf. Rom 5 , 5). AND THIS IS ALSO THE LOVE THAT IS GIVEN TO SPOUSES IN THE SACRAMENT OF MARRIAGE. IT IS THE LOVE THAT FUELS THEIR RELATIONSHIP, THROUGH JOYS AND SORROWS, QUIET AND DIFFICULT MOMENTS. IT IS ‘THE LOVE THAT AWAKENS THE DESIRE TO CREATE CHILDREN, WAITING FOR THEM, WELCOME THEM, RAISE THEM, EDUCATE THEM. It is the same love that, in today’s Gospel, Jesus reveals to the children: “Let the children come to me, do not prevent them: for the Kingdom of God belongs to such as these” (Mk 10:14). Today, WE ASK THE LORD THAT ALL PARENTS AND EDUCATORS IN THE WORLD, AS WELL AS ALL OF SOCIETY, ARE MADE INSTRUMENTS OF THAT ACCEPTANCE AND LOVE WITH WHICH JESUS EMBRACES THE LITTLE ONES. He looks into their hearts with tenderness and solicitude of a father and a mother at the same time. I think of so many children that are hungry, abandoned, exploited, forced into the war, refused. It is painful to see images of children that are unhappy, looking lost, fleeing from poverty and conflicts. They are knocking on our doors and our hearts begging for help. THE LORD HELPS US NOT TO BE A ‘FORTRESS-SOCIETY,’ BUT A ‘FAMILY-SOCIETY,’ WHICH WELCOMES, WITH PROPER RULES, BUT WELCOMES… ALWAYS WELCOMES… WITH LOVE! Yesterday, in Santander, Spain, there was the beatification of Pio Heredia and seventeen comrades of the Cistercian Order of the Strict Observance and San Bernardo, killed for their faith during the Spanish Civil War and religious persecutions of the 1930s. We praise the Lord for their brave witness and their intercession, and we call on Him to free the world from the scourge of war. I wish to address a prayer to the Lord for the victims of the landslide that engulfed a village in Guatemala, as well as those of the floods on the French Riviera in France. We are close to the hardest hit populations with concrete solidarity. I thank all of you who have come in great numbers to Rome, Italy, from many parts of the world. I greet the faithful of the Archdiocese of Paderborn in Germany, those of Porto in Portugal, and a group from the Mekhitarista College in Rome. On the day of Saint Francis of Assisi, patron saint of Italy, I greet with particular affection the Italian pilgrims!, in particular the faithful of Reggio Calabria, Bollate, Mozzanica, Chestnut, Nule and Parabita. I greet the boys of Belvedere Spinello and the Association for the Rights of Pedestrians in Rome and Lazio. (October 04, 2015) © Innovative Media Inc.